Giving the J. Crew beach tassel tunic its very first outing (at last)! Just a quick OOTD today as at last the sun has been shining and we have been able to go out and about. Today we went to Sark, which was absolutely beautiful. I haven't been for many years but it was just as magical as it always was. "I feel like Anne of Green Gables" I shouted as I whizzed down the lanes on my bike. "You don't look like her" came the witty reply. But really, Sark is like a mixture of Anne of Green Gables and the Famous Five. However this is an outfit that I wore yesterday when, for the first time during our two weeks away, the sun actually shone. I bought this embroidered tassel beach tunic from J. Crew when I was in America a few weeks ago and I was really happy to be able to wear it. It's quite good for Guernsey because the fabric is quite substantial so it just about kept the breeze at bay. Last day tomorrow and the sun is predicted to shine. For anyone coming here next week, it looks as though your luck may be in! Yellow petit bateau coat, for when it truly threw it down. With that lot on my top half, it was hard to feel cold on my legs and in fairness, when the sun did choose to shine, it was warm enough for shorts - not like that whole February LFW thing when all the celebs are so keen to show off the new season's fashion that they flash their pants despite the snow. I have always loved Cath Kidston and Cath and Guernsey are another match made in heaven. And Cath at a beach kiosk, well, it just had to be done. I bought this bag in Selfridges on the morning that we came away, having seen it in there the day before. If I'm honest, I think that I fell in love with the luminous pink. Bet no-one saw that one coming. All due credit for the mercy dash to get the bag has go to Mr SG who, despite not being remotely interested in such things for himself, totally gets it. Apologies for the random foot, which appears to be mine. I've linked to the Cath Kidston bag online, despite the fact that it's out of stock, just because there are further details if anyone did want to try and track one down. Rainy days and Sundays (in Guernsey)! Guernsey beach kiosks are legendary and we often head to one as soon as we've landed. Yesterday was no exception and after a quick change into a GAP striped dress and flip flops off we went for a cup of tea. Sadly the tea is no longer served in polystyrene cups at the kiosks, which causes Mr SG great distress. Happy birthday to all of us - it's not about turning back the clock it's about making the best of what we've got! I'm really not one of those women who worries about her age too much. Sure, when I enter my date of birth on line and I have to scroll back FOREVER to reach 1970, it sort of registers. And as I gradually creep up the age categories in the Park Run that too stings ever so slightly. Also, I'm never quite sure whether the comment "Really? Are you that old? You don't look it" is really a compliment or not. The older our eldest gets, the more obvious it must be that I'm no longer a spring chicken - not unless I had her at about 15. That aside, I don't stress about the latest line or wrinkle. I think that is such a rocky road to go down and can only lead to misery because one's thing for sure, as we get older we're going to look older - and that's how it should be. When I saw recent photos of Jane Fonda looking not much older than me it really freaked me out. It was as if someone had preserved her in aspic since the 1980's and had recently got her out to start living again. Nothing ages someone more than holding text at arm's length to read it. When your arms are no longer long enough, then it's time to take action. But not with half moon glasses that have to be peered over. They're not much better! Equally two pairs of glasses doesn't work that well either. "Where are my reading glasses, I've got the wrong ones on?" is a phrase I never wish to utter. "My achilles is really sore." "I remember you hurting yours before." "Yes, I remember you hurting yours too." "Can you remember how long ago it was?" "Do you remember how you got it better?" "Shall we just keep on running then?" "Yep, sounds like a plan." If you've been sitting down for a while, before moving a muscle to stand up, plant a great big fat smile on your face. There's nothing that gives away an ageing body as someone standing up and going "oooh, ouch, ahhh." Grin through the pain. Or alternatively don't sit down for too long. Grey or stray, they need to go. Dye them, pluck them, zap them however you like but they have no place in your life - or on your chin. Please don't ask me to go on a trampoline. Ever. And no self respecting aerobics teacher should ever ask a woman who has had children to do star jumps. That's just asking for trouble. How many other women have you seen trying to do star jumps whilst keeping their knees together? Don't the instructors get it? I'm not there yet and hopefully won't be for some time, however it's impossible to fight the inevitable - assuming that we are lucky enough to get there in the first place. I know that for some women the menopause is dreadful beyond words. My aim is to exercise and eat as healthily as I can through it. My husband may well find me lobbing a trainer at him for no apparent reason, or asking him to pass me the chia seeds before dissolving into tears but at least I won't be throwing a packet of fags or asking him to pass me a bottle of wine. Maybe when I hit that stage he'll be pleased that I like to run so much as it will offer him peace and quiet from the hormonal wailing banshee who has replaced his wife. All those things that we never thought that we would do again - or at all - we should do them! Whether it's shopping in Topshop, learning to ski, doing the high ropes, learning to swim or dive or starting to run, we should give it a go. 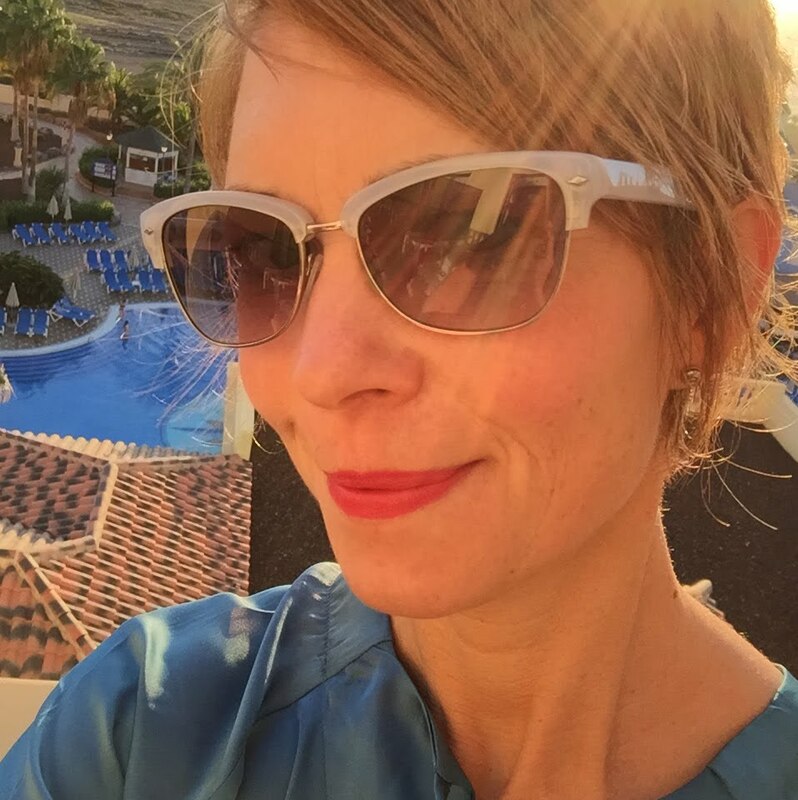 Confidence is a huge issue as we get older but there's no reason why we can't still have fun too. It's our spirit that keeps us young - not a line free face. This spectacular treat was from Scoops in Caernarfon, which is famed for its Dutch pancakes and Artisan ice cream. It's definitely worth a visit if you're ever in North Wales. Hope that everyone is enjoying their hols! 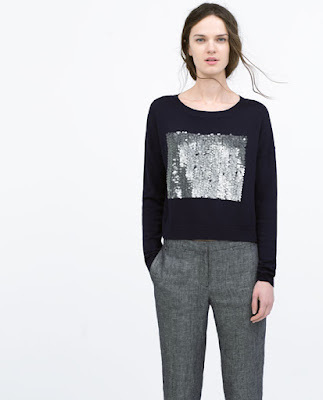 A Zara statement sweatshirt....with sequins and everything! 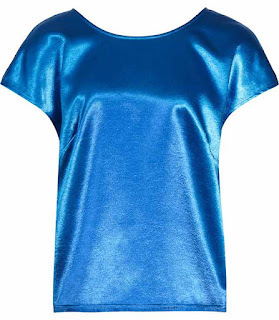 Meet one of my favourite styles of dress - it's the perfect all rounder! 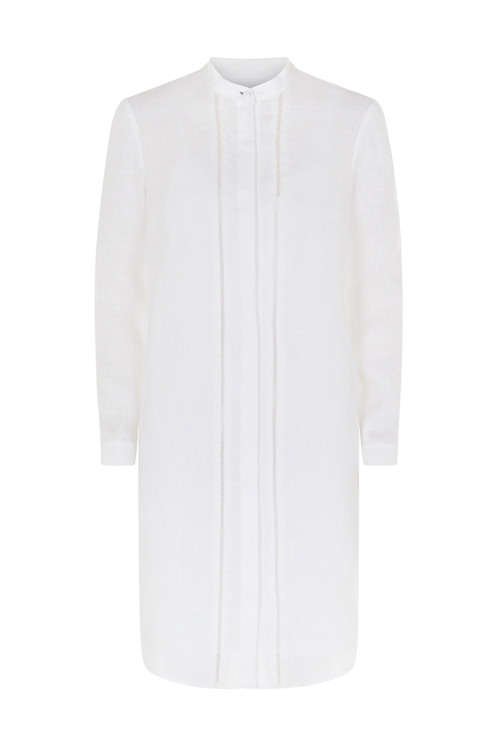 A shirt dress really is one of those dresses that's a good all rounder. 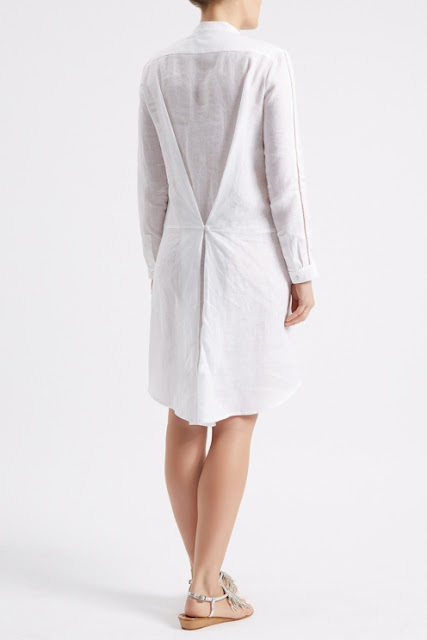 There's a much wider range of clothes that can now go from the beach, to the bar, to the boardroom and this linen shirt dress from Whistles (available in store but not on line) is definitely one of those items . I first spotted it on a friend who was wearing it whilst out walking her dog. Along with her coral lippie and sunglasses it looked fab. When we next went for our run, I asked her where it was from - and then I mercilessly copied her. I'm wearing my shirt dress in quite a dressed up way for me, at least, with Jigsaw heels plus some tassel earrings and a pom pom clutch, both from Accessorize. I worked with this Fenn Wright Manson linen dress (down to £69 from £169) at an event that I did a few months ago now. I like it for its length and the fact that it has an under slip to prevent that whole see through business. We styled the dress for a festival with lots of necklaces and bangles plus flat beaded sandals but it would work just as well with some heels and gold jewellery for a dressed up look. 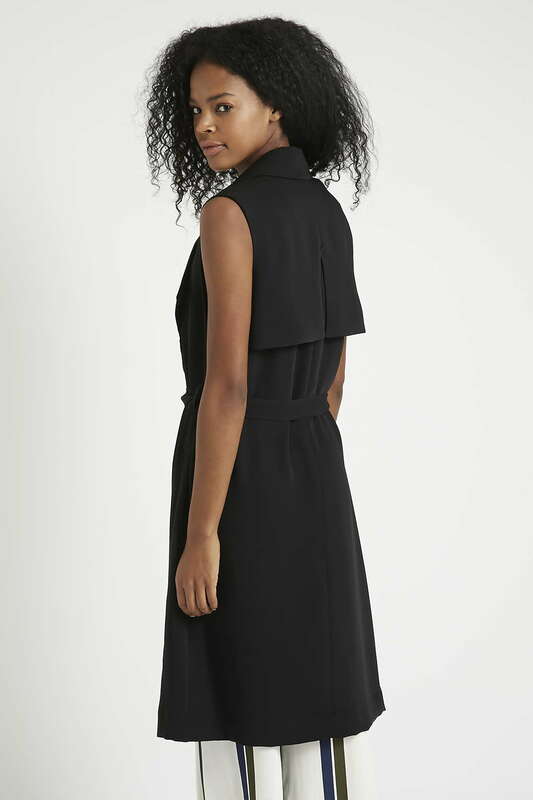 Although this dress doesn't come with a belt, it has this lovely button detail at the back, which stops the dress from being too voluminous just by pulling it in a little. Thinking ahead to the late summer/early autumn, Atterley has this lovely luxury shirt dress in burgundy (£55). 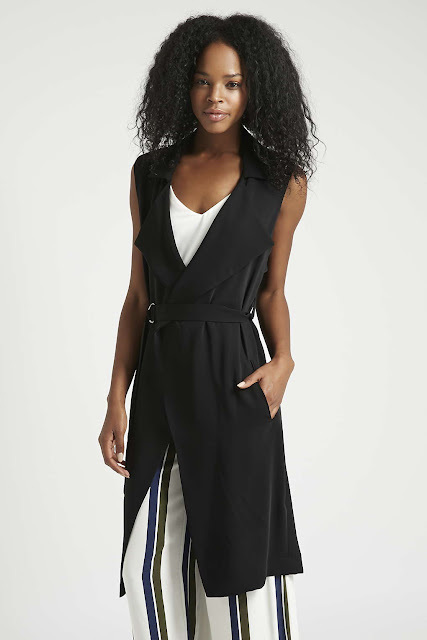 It also comes in navy and black so there's plenty of choice and it has that versatility of being able to layer something under it (maybe a striped top) or something over it (maybe a leather jacket). The shape could be changed by belting the dress and then pulling the dress up over the belt to make it shorter and slightly more blouson on the top half. I also love that for those ladies with a curvier bust, the top few buttons of the dress can be undone to create more of a v-neck, which is so much more flattering. Later on, as the weather gets colder, it could be worn with tights and boots - so there are plenty of options. Just a note about the Whistles dress, once ironed, it doesn't crease too much, unlike some linen clothes. As to size, it comes up huge. I'm wearing a size 6 but there wasn't that much difference between that and the 4, so if you do come across small ones in store, don't be put off by them. Let me know your shirt dress views. I love them for their easy, throw on nature - they're a bit like the sticky toffee pudding at a dinner party - a bit safe but good enough for everyone to love. A very quick OOTD post - Hush dress, Jigsaw boots, Boden cardi - job done! Having given my Jigsaw boots and playsuit a whirl the other day, today I tried the boots with a dress which I bought from Hush last summer. The cardi was from Boden last summer too. I hadn't worn them together - in fact I hadn't worn either of them that much at all - but I paired them up today and off we went (to Wales) but not, for now at least, in the rain! If there's one person who pulls off the shorts and ankle boots look a treat, it's Kate Bosworth. It's a tried and tested look that she wears over and over again. Obviously having very slim legs that go up to one's armpits helps. For the rest of us mere mortals - OK, me - it's never going to be quite so successful however, we're all entitled to make our own way in the world! I saw these Jigsaw Sally ankle boots (reduced from £139 to £69 in the sale) when I was shopping in Leeds a few weeks ago and I added them to my pre-winter stash of necessary items. 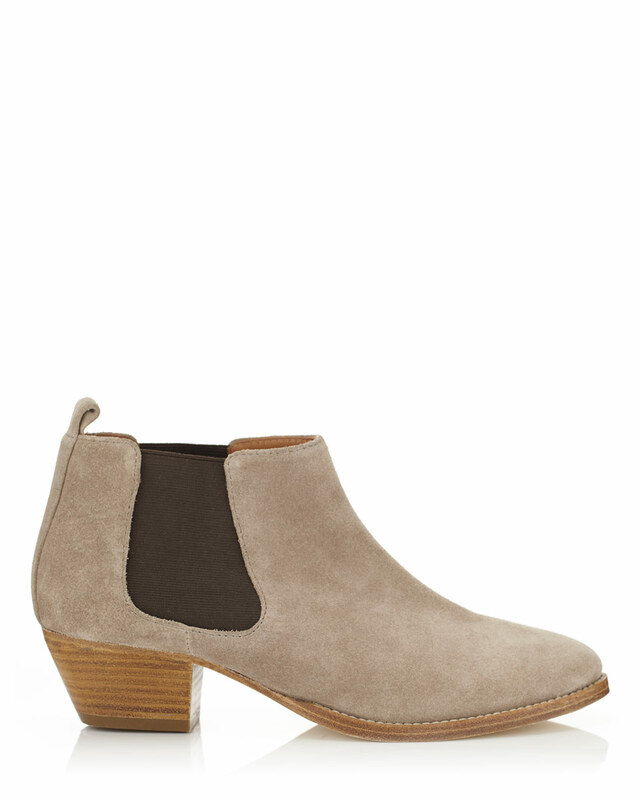 They were designed to replace a similar coloured pair of Zara ankle boots which I bought a few years ago. Having found them so useful I knew that this pair would be a good investment and the slightly lower heel makes them more wearable every day. Anyway, I thought that I would give the above look a whirl as it also gave me a chance to style my Baukjen playsuit in a slightly different way. Although it was warm today it wasn't hot and I'm really trying to embrace the opportunity the weather is affording me to wear some slightly different combinations that others might wear in April or late September, when I am head to toe in my thermals. But you know, if we never tried anything slightly different the world would be a very dull place. So, is there a combination that you're going to wear that you haven't done so before, or have you had any recent magnificent successes? 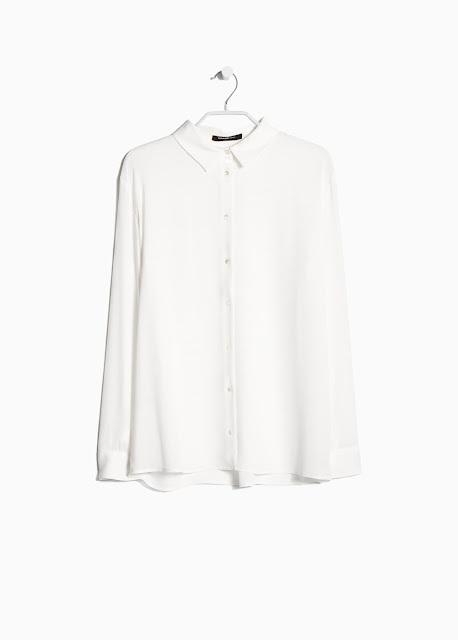 My Zara sale star buy! Sometimes the best buys that we make aren't expensive, or "big" or things that we've coveted for months but rather things that we spot out of the corner of our eye and which make our heart miss a beat. I know that this makes me sound very simple but for me it was this navy sparkly jumper in Zara, which was reduced from £25.99 to £7.99. I came across it yesterday - the last one in the store but I've just checked and it's still available online in both navy and khaki. It only comes in one size - a medium - which kinda makes things easier. 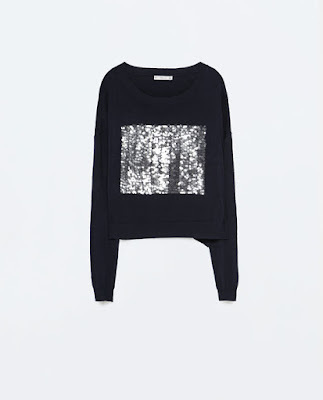 Some people collect jeans, or shoes or bags - well I collect navy sparkly jumpers and this is my new favourite. Reasons why I like this jumper? It has a decent weight to it so it will keep me warm. What more do I need to say?!! Have you made any great sale buys. Come on, 'fess up! ps If you look closely by the ankle strap of my left sandal, you can see my Sponge Bob Square Pants plaster. Such a classy bird!! White jeans - a summer staple or a style nightmare?! Having taken the outfit shots and having loaded up the photos, I'm now going to be incredibly unhelpful and tell you that the white jeans that I'm about to write about aren't actually available online. Sorry. However I do have a plan, which you can find out all about later in the post. Yesterday I bought three pairs of Whistles jeans (I know, ouch) - one white, one navy and one black, all of which had between 60% and 70% off. At full price they would have been £285 (well they wouldn't because I wouldn't have paid that) but I ended up paying about £115 which isn't to be sneezed at but they will last me for many years. Too tight and they can be a bit yuck and too loose they can wrinkle horribly around the knees - and as you can see above, wrinkles in white jeans really show. I've tried a few pairs of white jeans this season - GAP skinny with rips, GAP girlfriend, Hush and the ones that I wanted to try, Baukjen, had sold out in my size by the time they went into the sale. However with two UK based holidays approaching, I just thought that some white jeans might lift my mood when the rain sets in! I had nearly given up on white jeans when I came across these Whistles ankle length ones yesterday. They have plenty of stretch, they're thick and supportive, the rise isn't too low and so in the end I just threw caution to the wind and went for it. I know, living life on the edge again. So if you too are on the hunt for white jeans, it might be an idea to take a trip to a Whistles store. If there's not one near to you, customer services are usually really good at trying to track items down and they can be sent out to you. For info purposes the ones that I am wearing are a 26". The good thing about Whistles jeans is that they come in some in between sizes too, so a 27 (size 9) and 29" (size 11) too which is handy to know in general. So, white jeans, yes or no? Too impractical or a great option for a lighter summer jean without losing the warmth that the weather suggests we might need. As many of you will know, it's prom time of year. I've heard some horror stories about prom outfits. One chap who was at our house fixing the dishwasher told me how his wife had bought his daughter a prom dress that cost over £700. He was so incensed that he left the family home for two days and went to stay with his Mum. On top of that there were still shoes to buy, a limo to pay for, plus the hairdo and so on. Now that's a big fat "Ouch". Well let me tell you, there was none of that in this house! I do understand that prom (not my favourite term but let's go with it for now) can create all sorts of issues for the girls. Long dress, short dress, colour, fabric, cost - well the usual that us ladies face when choosing a special outfit. The one thing that I do really like about prom though is that after weeks of revising, wearing tracksuits, no make-up, hair in a ponytail and glasses on - it gave our daughter the chance to dress up and have some fun and that was lovely to see. I'm not one to offer fashion advice unless it's requested but Flo and I did have a brief chat early on about what sort of outfit she wanted to wear. She's old enough to make her own decisions so my only suggestion was to encourage her to think about wearing a less obvious choice than a short, tight, cut out number which although can look lovely, isn't really her. Initially she ordered a few beaded dresses from ASOS but even the size 6 didn't fit. She has a tiny waist and although they were really pretty on her, she didn't feel that they were quite right. And then one Sunday when we were in town we nipped into Coast in Debenhams, just on the off-chance to see what they had. She had thought about wearing a 1950's skirt and the assistant that I know kindly looked in the stock room and produced the size 6 skirt that she is wearing above, reduced from £120 to £59. Within minutes the deal was done. 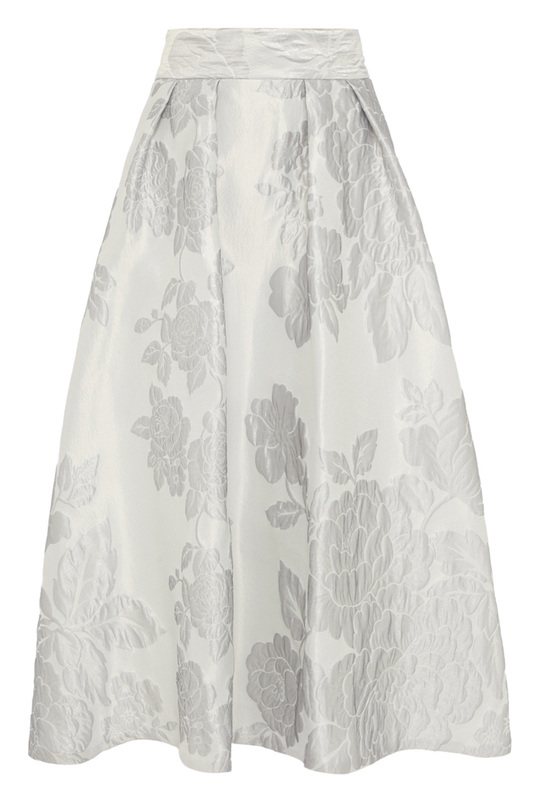 The skirt that Flo had was the Rita skirt but the nearest at the moment is the Coast Eve Jacquard skirt (£129 - below). They do the Rita style every season in a few prints and it's a real gem, especially for those ladies who are more pear shaped as they can show off their narrow waist whilst not having anything that skims or clings over the hips and thighs. 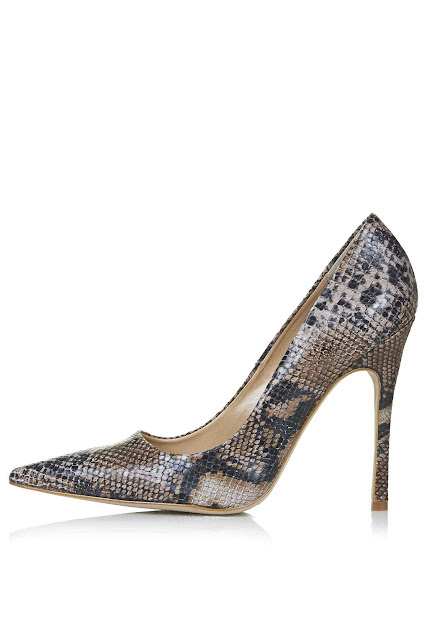 Plus the addition of heels elongates everything too, giving a lovely silhouette. I've just shown this Coast Kalisse skirt (£120 instead of £160) and matching top to my husband and I've told him that I'll be wearing it when we renew our wedding vows, which having seen this outfit I now have plans to do. Oddly he seemed slightly bemused. But seriously this is a great outfit for a bride, whether first, second or third time around. 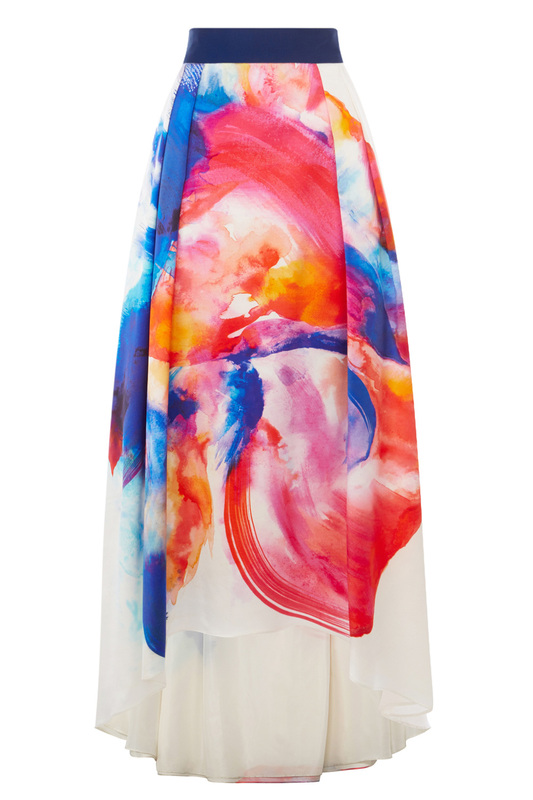 I've styled a client in this Coast hyperbloom skirt (£165) for a wedding that she's going to, along with the top below which is from Reiss. You may have seen Susannah Reid wearing the skirt of this month's cover of Good Housekeeping. What I love about this style skirt is that it really does transcend the ages so well - from 16 to 60 (and beyond) it's a great option. So I know that it's not overly covered up but it's no more revealing than anything that might be worn on a beach. And sometimes you just have to appreciate when to let things go a little! As for shoes, we left them until pretty late - the day before in fact. And the hair appointment too but all worked out well in the end. Flo was accompanied by her friend, Josh, who was the perfect gent bringing her a beautiful corsage. Apparently one boy who she has known since Primary School went up to her and said "Flo, I like your attire. " I had a budget in mind of £100 for the outfit and this came in at £98.99 which was a little more acceptable than £700. Even now I can't help thinking about that poor chap! When confronted by lime green sandals, what's a girl to do? * Stop going to the shops may be a good idea. Or maybe just not trying things on when I get there. Simple really. 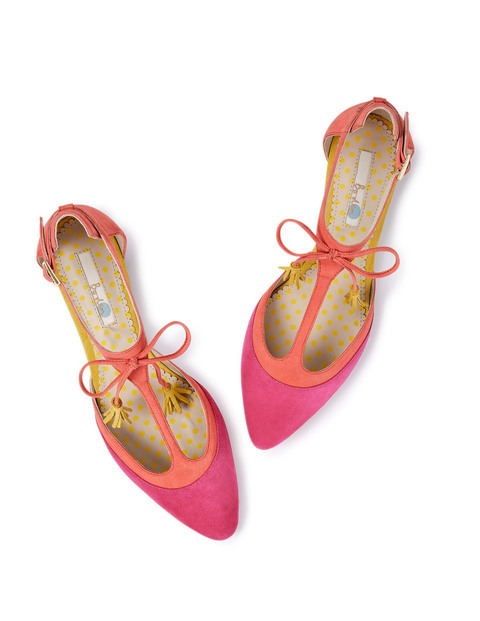 Today I wanted to share my current favourite flat shoes with you - the Boden Alice flats (£59.40 in the sale). I have had them for a few weeks now and the first thing that I did when they arrive was to treat them with some suede protector. The second thing that I did with them was to wipe my foot under the tyre of a car, leaving a lovely black stripe down the front of one of them. I must admit that I haven't got around to trying to get it off yet. But (naively no doubt) I am hopeful. Anyway, the reason for the special mention is because they are so comfortable and being a serious trainer wearer, it's something that I focus on quite a lot when it comes to shoes. Generally I figure that if I can walk a mile in a pair of shoes without them hurting, I can probably walk in them for hours without any problems. Obviously the fact that they are pink and have a tassel on them has nothing to do with it. Nothing whatsoever. I know that many of you struggle with finding comfortable shoes that are stylish so hopefully these may help. And unlike other flat shoes, they really don't make me feel dumpy. Ballet flats and I do not get on at all and I'm convinced that having a pointed toe makes all the difference - and really they don't crush your toes. Words cannot express how much I love our new pink bin. I think taking enjoyment from the smaller things in life is what it's all about - not that it is insignificant but you know what I mean - it's not a new car, or a holiday in the Bahamas either. Not so long ago, I could never have imagined wearing a jumpsuit but I guess that's partly because I hadn't found the right one. 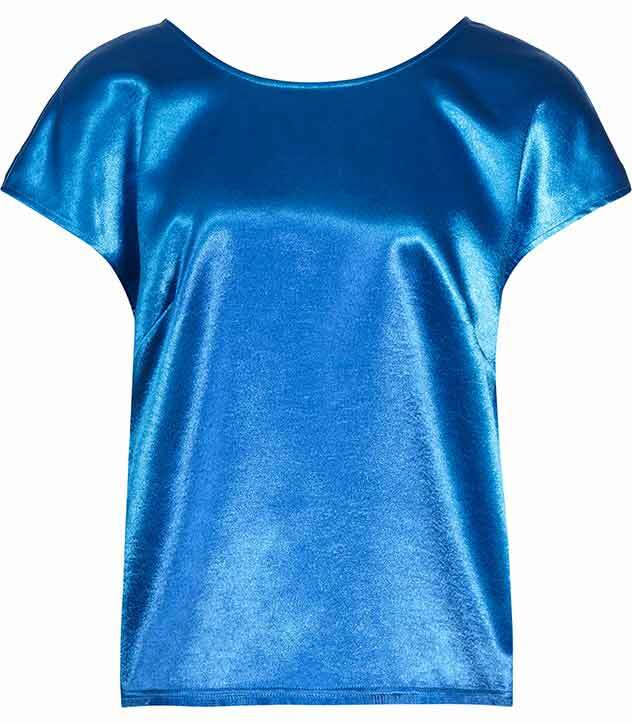 A very short, very tight, Ted Baker style one (lovely as they are) worn with heels for a night out would have just caused looks of consternation wherever I went. It's a bit like the off-the-shoulder top that I tried on the other day. What looked like a 19 year old's top next to the face of a 44 year old. Not so much. However just after Christmas I took the plunge and ordered the Baukjen playsuit that I'm wearing above. I didn't expect to like it but I was pleasantly surprised not only by its comfort and quality but also because of its laid back style. Whilst I couldn't deal with a jumpsuit in a dressed up environment I can get my head around it in a more relaxed setting, with flats and a stack of friendship bracelets. The drawstring waist means that I can alter the length of the shorts, the addition of a sleeve means that I feel less exposed and the neckline is one that I like. As with my denim Topshop jumpsuit that I've worn so much, an all in one outfit just takes the hassle out of dressing. 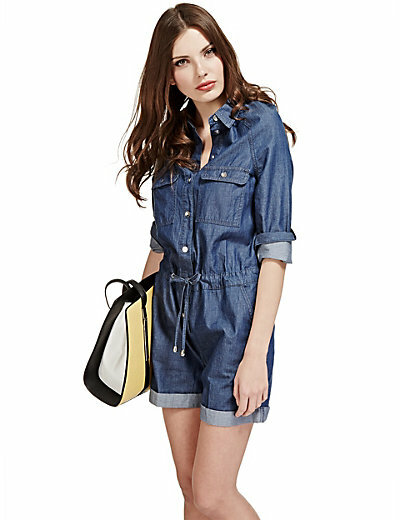 And M&S Limited Edition has this playsuit (£45) which I love for its denim look, although the reviews about its fit aren't great - but obviously one size doesn't fit all and I would personally still give it a try. In fact M&S has quite a good selection of jumpsuits, both printed and plain so it's worth taking a look there as a starting point. 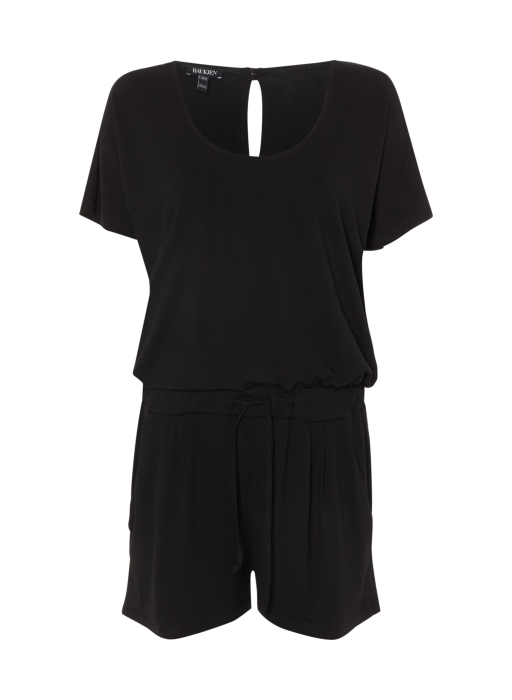 GAP has this tencel playsuit (24.99) which would be perfect for those who might prefer a little less coverage, possibly because they're going somewhere other than wet Wales or rainy Guernsey for their hols! I know that some of us may be over 40 and that some of us will soon be teetering on the brink of being nearer to 50 than 40 - but that doesn't mean that we have to resign ourselves to wearing mid calf, wide leg, flippy, flappy linen trousers in the summer. So as I was saying yesterday, I've recently done some work with lower 6th form students about what to wear to interviews. The outfit below was a soft tailored look as opposed to a more formal, corporate look. It's still smart and stylish but it's more modern than the suited and booted look. I love this Topshop sleeveless duster coat (£65) which is great for the warmer summer months. It has a lovely fluidity about it and is really smart without being stiff and restrictive. The detail on the back of the coat is lovely too and it could be styled with the belt tied loosely at the back offering a great option for curvier figures as it just skims without clinging. Underneath the sleeveless duster coat I used this Mango flowy shirt (£9.99), which wasn't too sheer - a common problem with white blouses. I was really impressed by the quality and if it had had a Reiss label in it, I wouldn't have argued with it. It's a great offering for £9.99. 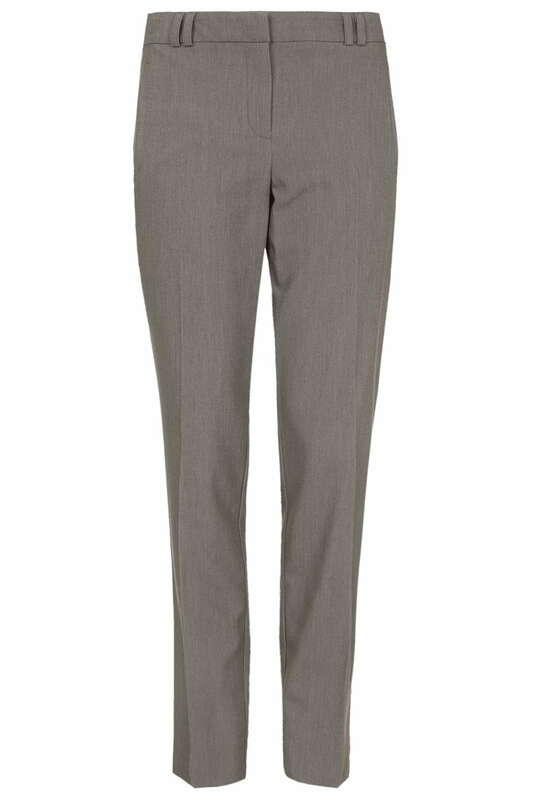 Topshop do their cigarette trousers (£22) in several different prints as well as in their short and tall range. I'm a big fan of this shape for a modern look as they are slim without beings skinny. I tried these on just to see what they felt like and I was really impressed with them. I'm always in between sizes with this particular style of Topshop trouser so they don't quite work for me but otherwise I would buy a pair like a shot. They also come in black and are machine washable, which is always a bonus. 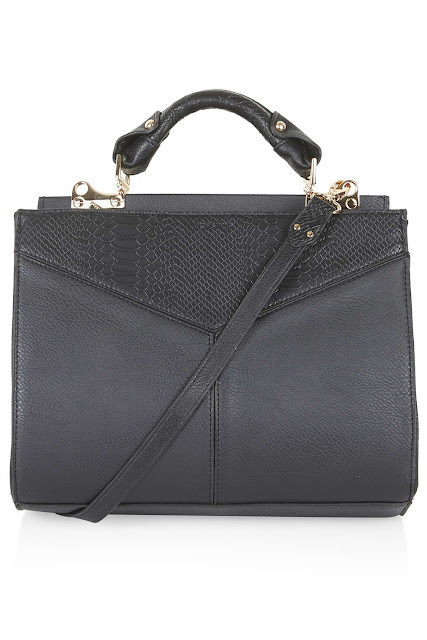 and the Topshop snake effect panel bag (£40) filled another. The structured bag offered a nice contrast to the more fluid and drapey fabrics on the top half of the outfit. With the basis of this outfit being such a simple colour palette, it would be easy to ring the changes and swap the accessories for brighter ones, clash them, tone them, add in some statement jewellery and really have fun with it. So I hope that some of you will!